Holding my breath with anticipation as I read the story at some parts and the suspense causing increased excitement at others are a couple of my reactions with each page I turned. 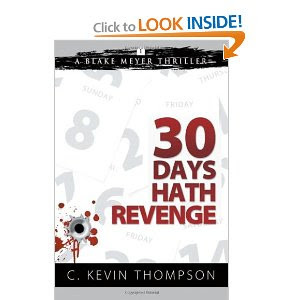 I love political intrigue/mysteries, especially those as well-crafted as 30 Days Hath Revenge, the first book in the Blake Meyer Mysteries. Before you read anymore of this review, let me tell you that a sequel is to be released in early 2014 titled, Triple Time. How I wish that book was available now to read in order to see where the continuing action and suspense leads! Blake Meyer had been in the military and then joined the FBI before marrying and starting a family. Looking forward to semi-retirement, he is instantly thrust to the forefront of action when his past enemies seem to be resurrected. On top of that, the danger isn’t just to America, but globally with death being literally a breath away. With twists and turns, the plot thickens. Blake Meyer is about to experience pain he has never had before due to the evil intent of others. One man has been reaching out to Blake about God, though Blake at this point claims to be agnostic. Agents in the FBI as well as the President have been looking for a mole, because trusting just anyone could cost lives in uncalculated numbers. I could not stop reading this novel until the end. It was intense and filled with action that was nonstop. Also, seeing how various characters were being portrayed kept the mystery alive as well as active when other aspects of the plot were uncovered, causing me to wonder if there was more to the players than met the eye. When the author contacted me about this series of novels, I was excited to see what lay in store for me as I was being introduced to a plot that was awesome and engaging. The subject of bioterroism operations from the past with their code names being known to those who should have no knowledge and the global perspective just kept me reading all night long. How long had the enemies of America planned to carry forth their plan of mass death ? Those who, in the past, were hated enemies are now working together toward one and the same goal: To bring utter chaos to America. I don’t want to ruin the many different turns the plot takes or reveal too much because I want you to hang onto your seats and enjoy this breathtaking adventure! As I was turning to each new chapter, I was reminded time and again of the many people who put their lives on the line every day so others can enjoy the freedom of living here in America. I was reminded of different spy movies I have seen, not the James Bond ones, but others and the fact that families of those on the front lines are heroes too. One truth that is clear throughout the book is that without God we cannot have peace internally nor hope with each new day. Thanks to the author for offering me the opportunity to read the beginning of what I perceive to be a top notch mystery series no one will want to miss! I can’t wait for book #2 to come out! Kudos for a job well done!